Attend this conference. Really. If you’ve seen an ad or read their site and are considering it, just go. Writers love a good tote! 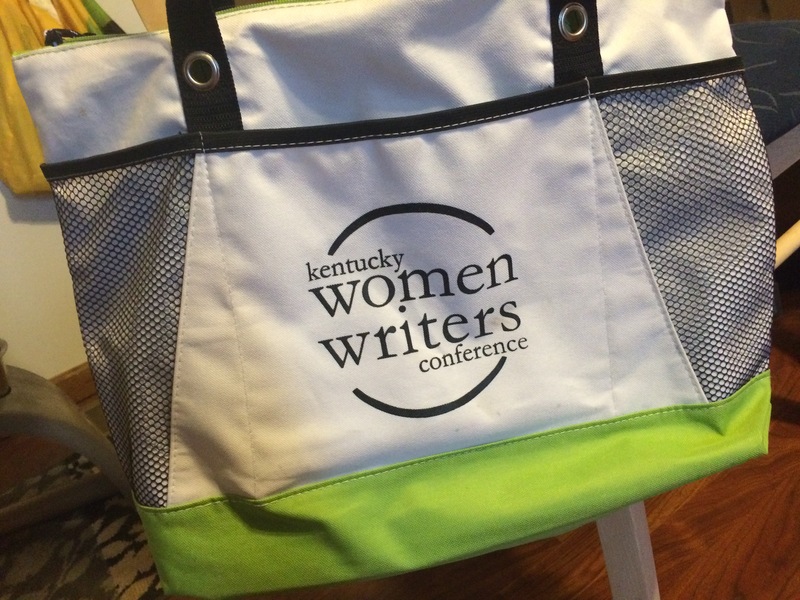 I attended the 2014 Kentucky Women Writers Conference. Here’s what I found. I flew in from PA, wondering if that would make me weird. It did not. I met women from Virginia, Michigan, California, Hawaii…HAWAII!! Of course there’s a local contingency there from the surrounding academic communities, but they seemed super excited to have us all visiting. The size was perfect. I’m guessing less than 200 people registered, and about 75 or so showed for most events. That’s enough to feel like a crowd, but still intimate enough to mix and mingle and recognize people from day to day. Networking/friendmaking/accountabilitypartnering were all in full swing because most of us were flying solo. We came to this event to connect. I mean who chooses to attend a small literary conference other than serious writers? Everyone I met was working on a seriously cool project (or 3 or 7) and was sincerely excited to learn about what everyone else was doing. It seems we all feel alone, living our little lives in places where no one else is doing what we do. So while the conference is open to anyone who wishes to register, it’s a pretty self-selecting group. Focus. This conference knew what it was all about and it was all about craft. So many conferences can focus on selling or pitching a “finished” project, but this one was more about working on/enhancing/exploring current work. (There was a very well received presentation by a literary agent, Liza Dawson, but there were no pitching sessions or anything like that). Most sessions were authors talking about craft or reading their work and then talking about craft. THE AUTHORS! I signed up because Jill McCorkle was going to be there and I’ve loved her work for years. I researched the others in the months that elapsed between registration and attending, and felt like I hit the jackpot. Leslie Jameson, Rebecca Makkai, Joy Castro, Margaret Wrinkle, Tracy K. Smith, Tina Chang, and Asha Bandele. Asha Bandele, people. She was one of those writers you read and are mad at everyone you’ve ever known because no one’s ever told you about her before!! Access. All those authors I just mentioned? I got to meet them. Side Note: I chose an optional workshop and did fiction with Sarah Combs. I was a little apprehensive because it had been a decade since my last workshop…and I had been an undergrad. But Sarah ran a wonderful workshop that made me sit and listen and play along. I’ve continued to develop everything I started during her exercises! If I had the Godly authority to hand out stars, I’d give plenty to this conference. Do go, and do enjoy! ← starting a lit mag. easier said than done.